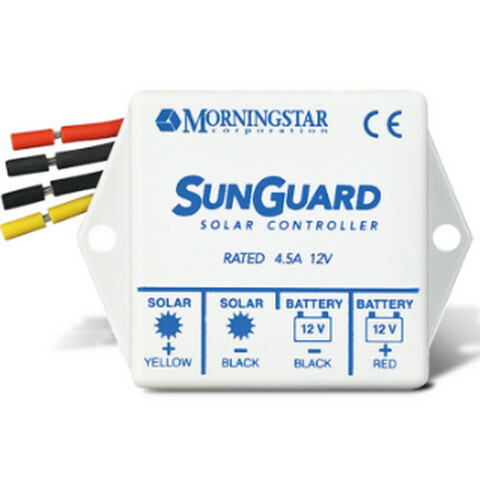 MorningStar SG-4 SunGuard 4.5Amp Solar Controller a single Module Controller, 4.5 Amp, 12 Volt. Morningstar’s SunGuard SG-4 is the world’s leading single module controller. Morningstar’s SunGuard™ is the world’s leading single module controller. The MorningStar SG-4 SunGuard 4.5Amp Solar Controller has combined all the advantages of our SunSaver charging circuit with less expensive packaging to provide an economical controller for small PV systems. SunGuard is a single module, compact solar charge controller for small systems, ideal for both professional and consumer use. Featuring the same components, charging circuit, and build quality of Morningstar’s industry-leading SunSaver controllers, SunGuard is easily the most compact, advanced and economical solar charge controller on the market today. With SunGuard, there’s no reason not to insist on Morningstar quality with any system design—no matter how small.